The country has a growth problem, but the single currency is not the cause, and going back to the lira is certainly not the solution. The story of the Italian economy is of course a complex one. Nevertheless, there are clear reasons why Italian governments were eager to adopt the euro, and why going back to lira is not very popular with the Italian public according as far as we know (and will probably not be attempted by the new populist government). 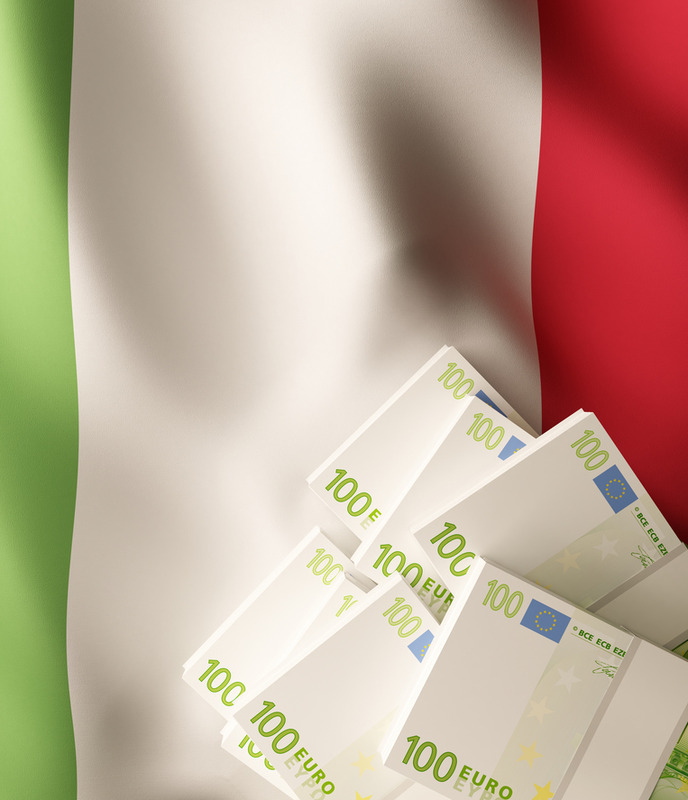 The finance minister, Giovanni Tria, has repeatedly said during the current negotiations with the EU Commission over the budget that Italy does not aim to leave the monetary union. 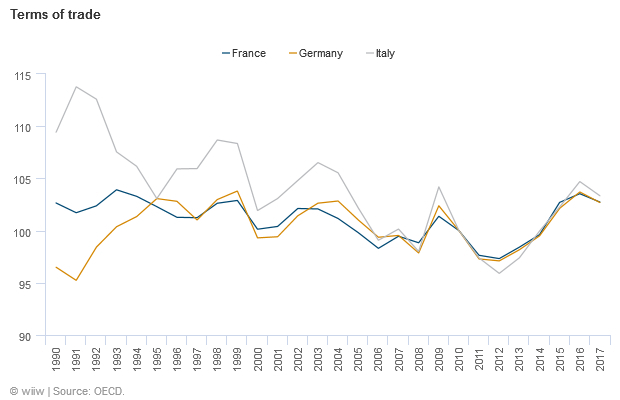 Figure 1 shows the development of the Italian public debt to GDP ratio since 1990. Clearly, it declined in the years up to the adoption of euro and until the crisis of 2008. The crisis, to remind ourselves, was not triggered by anything related to the common currency, but by the collapse of the financial system centred in New York. 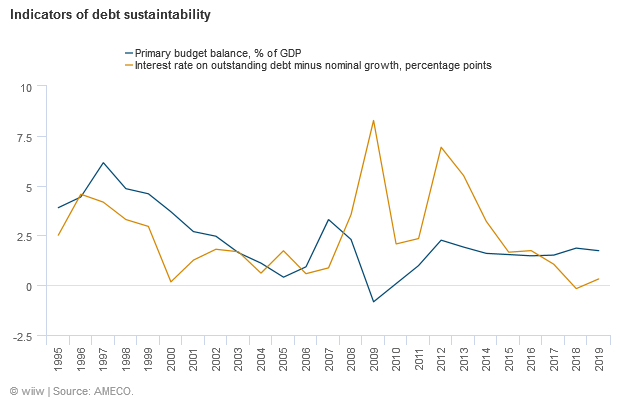 Therefore, if public debt sustainability was a concern of the Italian authorities, adopting the euro seems to have provided a solution at least on the evidence of the public debt to GDP development, both prior to the 2008 crisis and after. Figure 2 gives the history of the snowball effect on the public debt and of primary surpluses since 1995. The snowball effect is the difference between the rate of interest on the debt and the growth rate of GDP, while the primary surplus is the difference between revenues and expenditures minus the interest on the debt. If the snowball effect is positive, the interest rate being higher than the growth rate, it contributes to the growth of public debt. If this happens, a primary surplus is needed to keep the debt to GDP ratio constant. The size of the surplus required also depends on the level of public debt, and on the debt to GDP ratio. Figure 2 shows that the difference between the interest rate on Italian public debt and the growth rate of GDP went down significantly ahead of the adoption and after the adoption of the euro. Moreover, it has stayed low, relative to the lira years in any case, since the crisis, except for the initial year of the crisis and the year when the risk of the collapse of the monetary union was elevated. It also remained significantly lower than in the lira years after the height of the crisis ended. Therefore, the Italian government had to run much lower primary surpluses as part of the eurozone than when it used the lira. That means that with the adoption of the euro, fiscal policy could be significantly more relaxed than the lira-based monetary policy allowed. Another way to see the same story is in Figure 3. The yield of the Italian 10-year government bonds came down practically to the German levels since the adoption of euro. The spread, the difference with the German benchmark, widened during the initial year of the crisis and also in 2011-2012, which are the years where the risks of euro area disintegration was the highest. The spread is widening now too in view of the growing probability, the intent of the Italian government notwithstanding, that Italy will pull out of the monetary union. Assume that the probability of going back to the lira is just 10% now, with the spread between Italian and German debt rising to around 3 percentage points. At the moment of secession, and not considering initial overshooting, the spread might be up to 10 times more. That would be unsustainable, which implies that the newly-reintroduced lira would have to devalue by about 20-30% with an inflationary effect of a similar magnitude (again disregarding initial overshooting and possible mismanagement with the probability of both being quite high). Financial and capital controls would have to be introduced with an uncertain duration. Then, everything would depend on the other economic policy measures that the Italian government and the central bank would introduce. At the moment, there is hardly any idea what they would look like. This is what Italian voters would have to consider if there is a political decision to be taken on the issue of staying or leaving the monetary union sometime in the future. That suggests an explanation for the popularity of the euro in Italy. Based on experience, if the lira were to be reintroduced, either fiscal tightening would be needed, or one of two other policies would have to be pursued (neither of which appear very attractive). 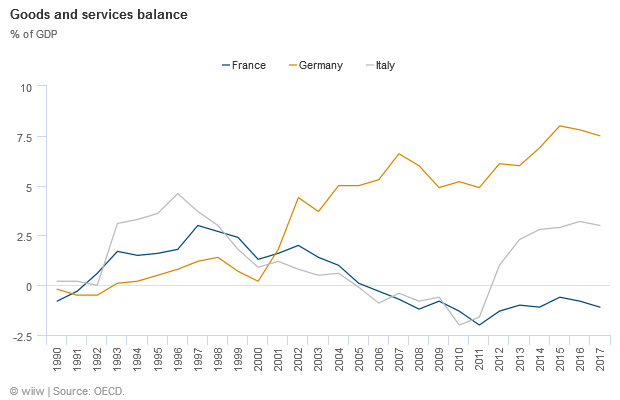 First, public debt could be inflated away, at least that part which is owned by Italians (about two-thirds). Second, debt would have to be restructured. In both cases, however, it is not clear at all that the Italian fiscal authorities would indeed be able to significantly increase real fiscal spending, and it is rather probable that tighter fiscal policy would in fact be required. Therefore, staying with the euro seems like a better alternative, even if the aim is to go for fiscal expansion to spur growth. The currently proposed fiscal expansion seems more like a reward to the supporters who voted in the current populist government. 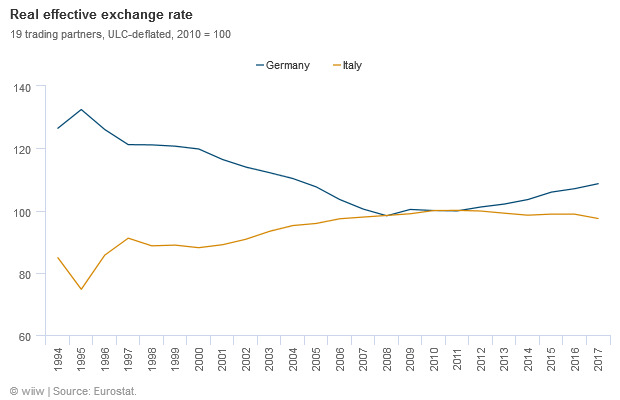 Moreover, it is not clear that if Italy left the euro it would experience an export-led recovery. 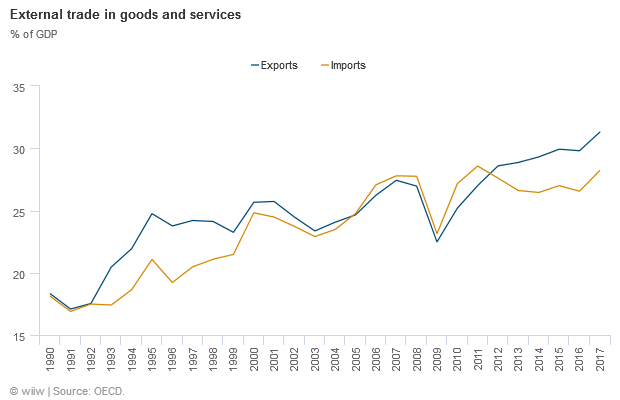 Figure 4 shows Italy’s exports and imports as shares of GDP again since before the introduction of the euro. Italy has clearly become a more open economy (e.g. 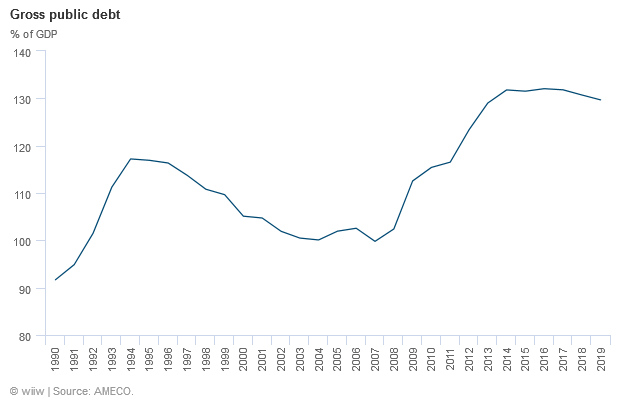 in terms of export to GDP ratio) after the adoption of the euro and in the last few years also. Figure 5 shows that Italy ran trade surpluses or balanced trade ahead of the crisis of 2008 and again after the peak of the euro crisis. It now runs rather significant trade surplus. Figure 6 and 7 show that this has been accompanied by favourable developments in the real effective exchange rate and terms of trade, as is to be expected. Therefore, it is hard to argue that the adoption of the euro has been detrimental to Italy’s trade with the EU and the rest of the world. Figure 8 shows manufacturing value added as a share of GDP in Italy, France and Austria. There are other comparisons that one might want to make, but the message does not really change. 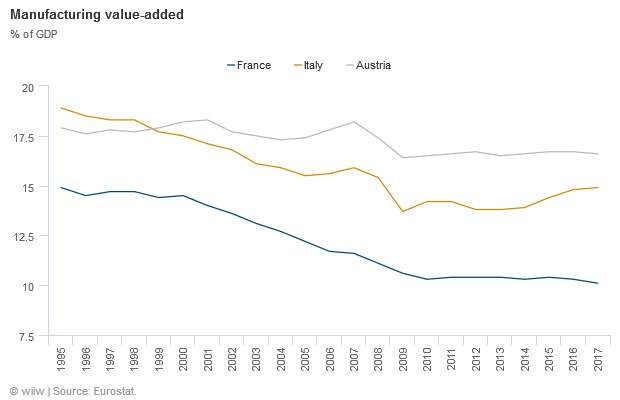 Since 1995, industrial production has declined in all the three countries, albeit less so in Austria. But it does not seem that anything out of the ordinary is taking place in Italy. In fact, among the more developed EU countries, Italy’s economy is closer in structure to economies with significant manufacturing sectors (such as Germany) than to the likes of France and the UK (where the manufacturing sector relative to the size of the economy is much smaller). In any case, it would be very difficult to show that it was the adoption of the euro that caused or contributed to deindustrialisation, as is often alleged by the populists both from the left and from the right who have taken over the government now. 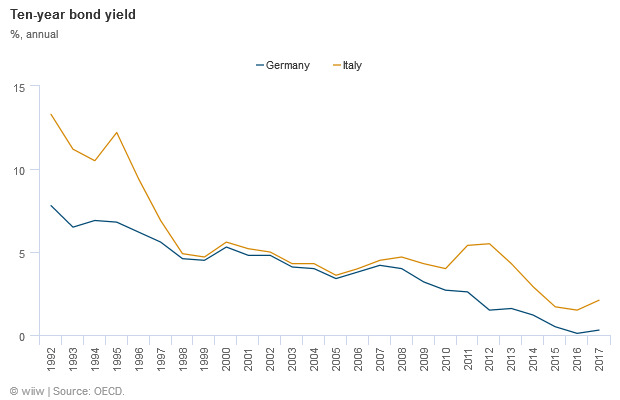 There is little doubt that Italy has a problem of growth. However, joining the euro has if anything helped, at least potentially, towards the solution of the problem, as it has relaxed somewhat the rather tight fiscal constraint. That was squandered in the period before the 2008 crisis, and ditching the euro is not going to help. This is why, according to most surveys of public opinion, going back to the lira appears not to command popular support, or the support of the new populist government.